Sparkles and ribbon and silver and gold! I'd forgotten completely to blog about this, but last year I was commissioned to create eleven circlets for a ballet studio in Indiana. These circlets are like the Aurora Circlets that I make, but in custom colors. 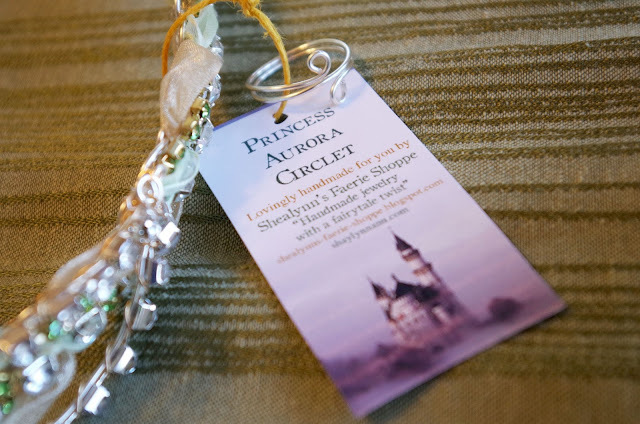 The circlets have more ribbon than the normal headpieces-- a strand of pale sparkly gold, and a strand of green. I purchased peridot green rhinestone chain to use on these. This was only the second time that I have made these circlets in anything but white, cream, or champagne pink! As you can probably tell, this project took an insane amount of work. Everything is completely handmade-- I make these circlets with nothing but a roll of silver-plated wire, rhinestone chains, and spools of ribbon. The circlets are adjustable for different sized heads; I think the ballerinas were going to weave braids in and out of the top "zig-zags" of rhinestones. I heard that their performance went beautifully! Well, friends, I am back at school, and am getting settled into my apartment and the first week of classes! I'm taking another hefty load, with a couple academic classes and several intense graphic design and illustration courses-- and running my business, doing an internship, freelance work, and hanging out with friends. (Plus, I'm preparing my booth at the Ozarks Mini Maker's Faire! More on that later!). As usual, I will be blogging a little less regularly during the semester. This post is just a quickie, to share my newest love of the arts: calligraphy! It's no secret that I love the beauty of letters; twelve-year-old-me filled an entire mini sketchbook with the names of best friends in really poor Blackletter calligraphy, and last spring's experiments with typography and calligraphy started to reawaken that love. I've already filled an entire Pinterest board with lettering inspiration. 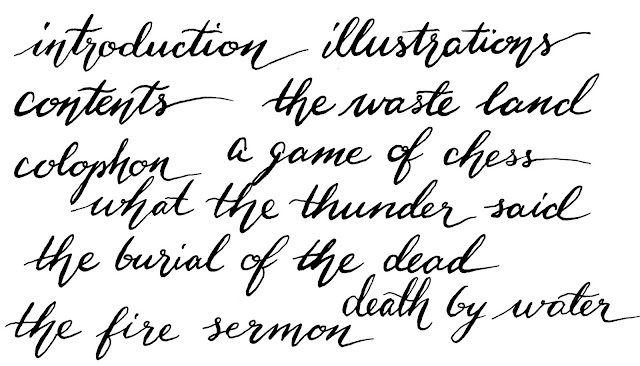 Then I bought a dip pen for an illustration course... and discovered pointed pen calligraphy. Basically, the calligraphy is created by applying pressure to a tined nib. The "prongs" separate and create lines of varying width. It takes a lot of control. This summer I started to creep on the #IAMPETH tag on Instagram (the acronymn stands for the International Association of Master Penmen, Engrossers, and Teachers of Handwriting) and found myself exposed to beautiful calligraphy that I had no idea existed. I have not yet put in the time to do drills and properly learn the different scripts, but by doing copywork and just experimenting, it's coming along quite nicely. Most of all, I can just have fun with it. Over and over again, I fall for the insanely detailed zen-like arts such as wirewrapping, celtic knotwork-- and now calligraphy. The above was one of my first pieces made with brush pens (the awesomely blendable Tombow Dual Brush Pens, to be precise). It's currently hanging across from my bed, and only two days after making it I'm already cringing at the mistakes I'm learning to recognize: inconsistent angles, inconsistent x-heights, and extremely inconsistent "e's". That will come with practice. For now, it's just relaxing and magical! (So for those friends who've been asking for prints: you are absolutely feel free to email me for a special print or original piece, but I am a ways off from being ready to treat my calligraphy as professional enough to sell prints on Etsy or Society6, etc). Also, I always have to bring in The Lord of the Rings. Just a bit of Elvish for you all! At some point in the future, when I am a more experienced calligrapher, I'd like to write a blog post reviewing my favorite calligraphy tools. Because, you know, awesome art supplies make my heart happy. (I have both the straight and the oblique cheap Speedball holders, and from my grandparents I also have the Tachikawa straight holder-- and someday in the future I would like to purchase one of the beautiful hand-turned wooden oblique holders that I've seen on instagram). The absolutely magic Pilot Parallel Pens. I just wish they came with smaller tips! My bottle of J. Herbin fountain pen ink-- I have a separate container for half of this ink, and I mixed gum arabic into it so it is thicker and appropriate for a dip pen. The worn-out fountain pen and felt broad-tip markers that I used as a twelve year old are there, too. I occasionally use my glass pen (mostly for writing letters and drawing, though, not for calligraphy). An assortment of Micron and Staedtler pens from drawing classes and my everyday fountain pen also live in the box-- for lettering, not calligraphy. That's all for now today! 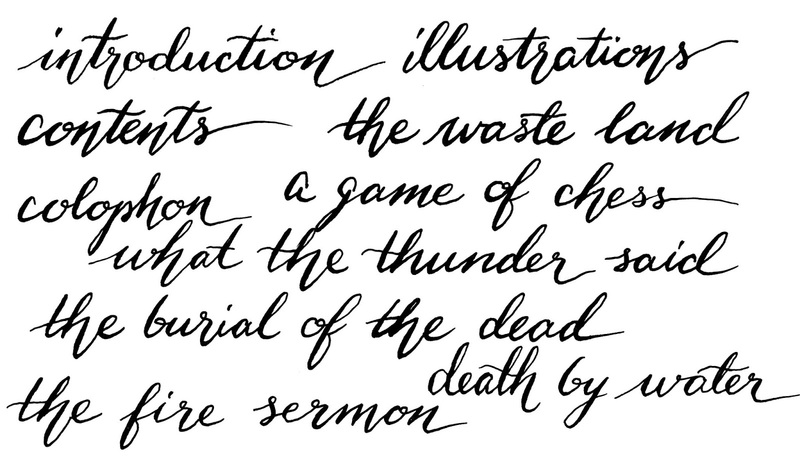 I'd love to hear in the comments if any of you have tried calligraphy, and how you like it-- and if you have any tips or good resources! 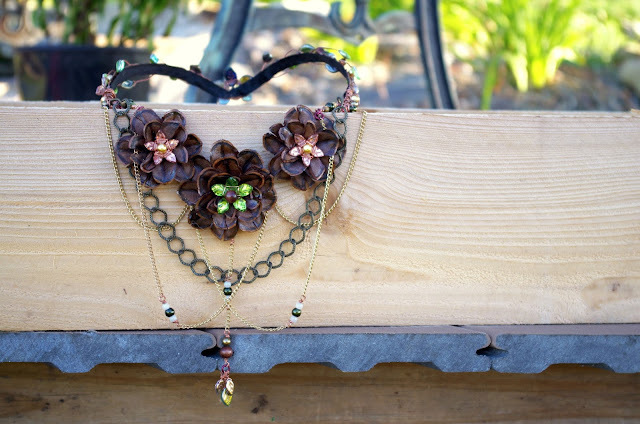 Every now and again I make the time to create a large piece of fairytale jewelry. I love creating these large "art pieces," but sometimes it is difficult to justify the dozen hours each piece takes, when I know I could be making dozens of smaller jewelries that sell more readily. Oh, the joys of running a business and needing to make money for school. 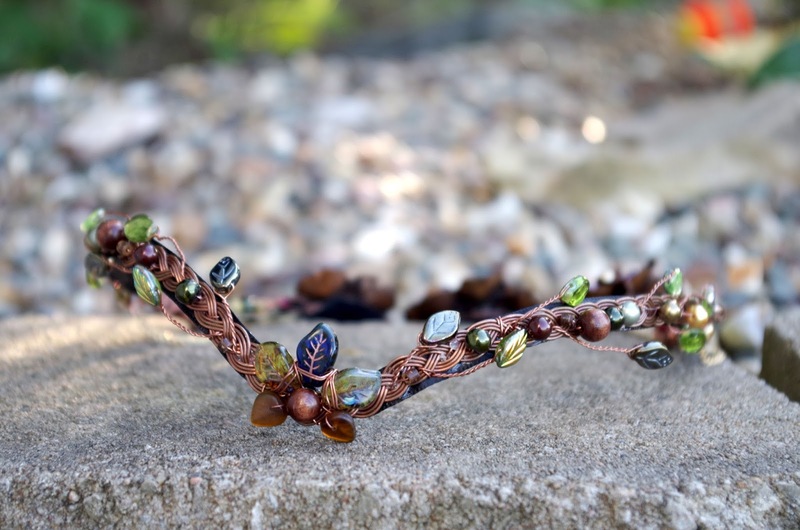 This spring, I was contacted to create a custom Entwife Circlet with oxidized copper, dark brown and green glass leaves, and black details. 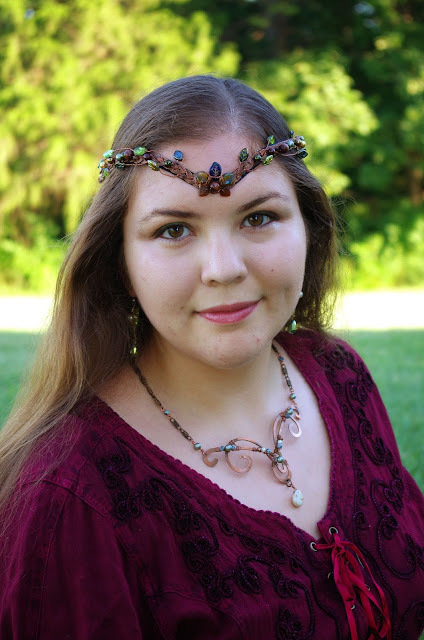 Unfortunately, the commission fell through, but I had already gotten enough work done on the circlet to finish it a bit differently and add it to my Etsy shop. I'm glad I did; every time I make large pieces like this, I can see my craftsmanship improve dramatically. Art (and hours and hours of practice) is really its own form of very human magic. 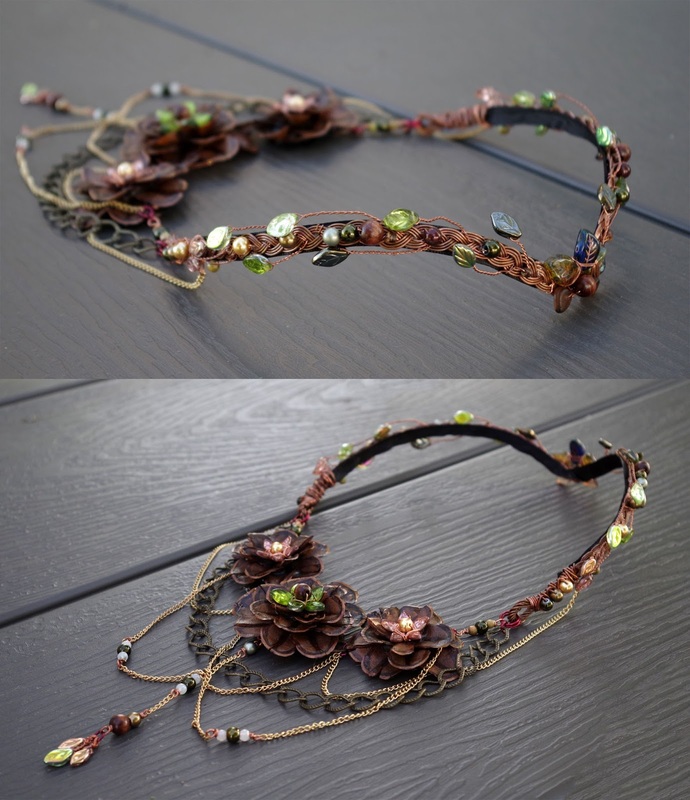 For those of you unfamiliar with my previous work, the Entwife Circlet was originally designed for a Lord of the Rings themed ball. 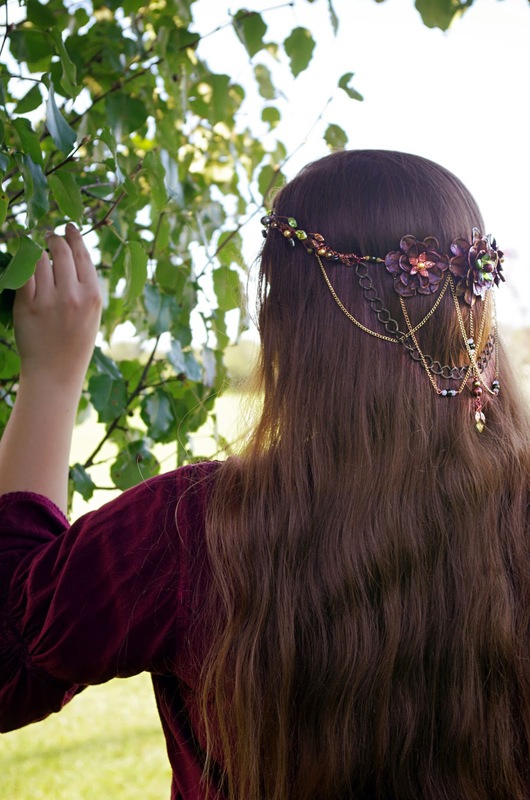 My friend was dressing up as an Entwife (the Ents were tree people, shepherds of the ancient forests of Middle Earth) and I created a custom ensemble of jewelry for her in exchange for a gorgeous medieval dress. You can see the jewelry ensemble here, and additional pictures of her handmade costume here. 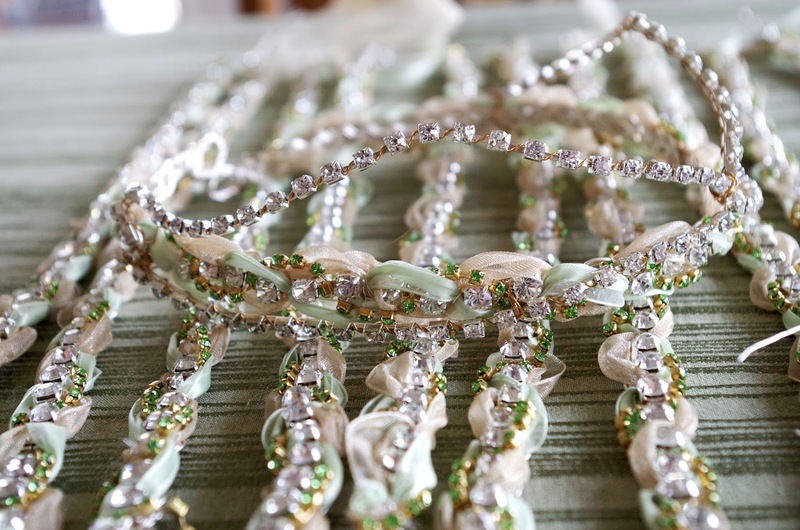 Last autumn, I created another one in brighter greens for a bride to wear at her wedding. The Entwife circlets are headpieces appropriate for any woodland or fairytale themed costume. 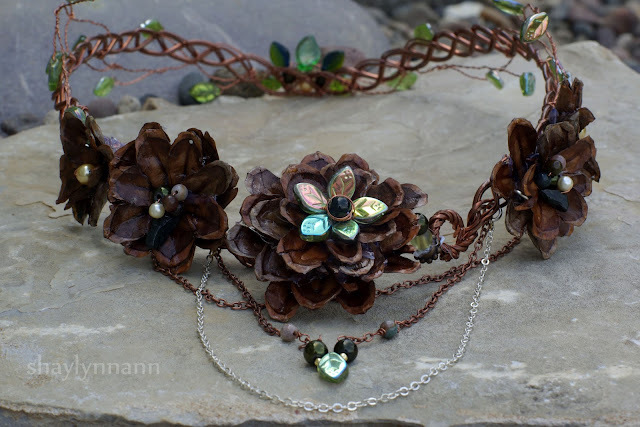 The most dramatic feature is an array of pinecone flowers on the back, with beaded chains that dangle over the hair. (This chain feature was inspired by the headpiece that the Elf Arwen wears in the Return of the King movie). 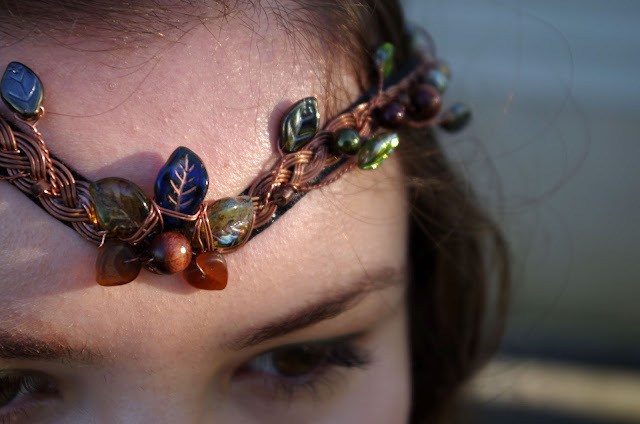 The base at the front of the circlet is made out of braided copper wire. 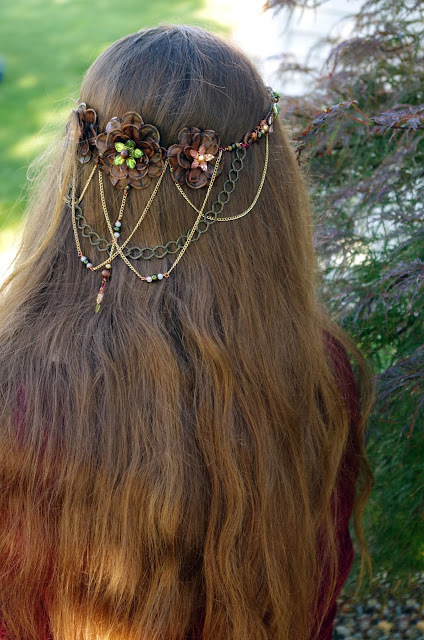 On this particular headpiece, I kept the copper raw (no jewelry wax to protect the color) so that it can oxidize and gradually change from bright shiny copper to a deep dark brown. 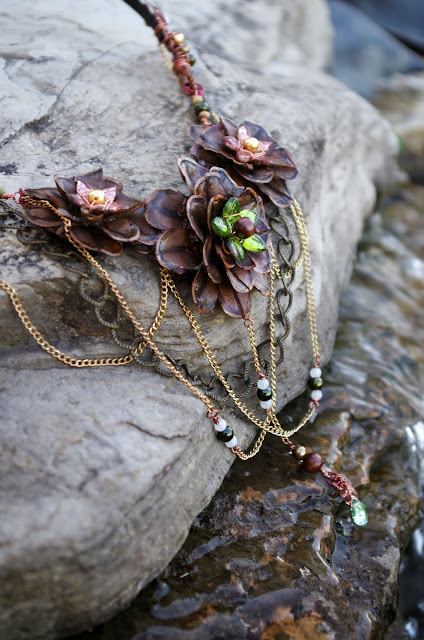 (Of course, any jewelry made with copper can be cleaned to a shine by gently rubbing it with vinegar, washing in water, and patting dry). Since copper reacts with the salts in many people's perspiration, I lined the front of the headpiece with a black ribbon. 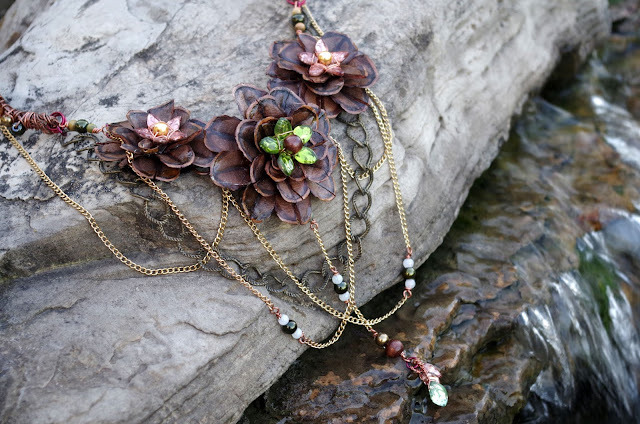 Czech glass leaf beads-- my most favorite beads in the whole wide world, short of actual gemstones-- are meticulously wirewrapped onto the circlet, along with Swavroski pearls and wood beads. The necklace and earrings will be up on Etsy soon! 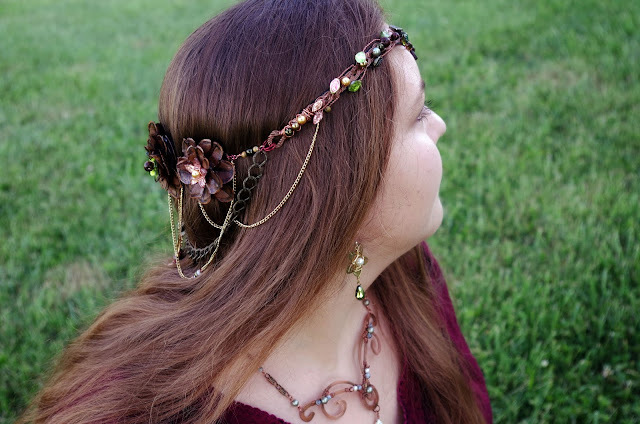 I didn't have any friends handy the day that I finished this circlet, so my sister Rosie helped out by manning the camera. Rosie has been my apprentice this summer and has learned about everything from how to package and weigh envelopes to how to use a soldering torch to designing Celtic knots to building workbenches with power tools to being the second shooter at both a portrait and a wedding photoshoot. I don't think I ever caught on to things so easily when I was eleven! Anyway, I hope that you enjoyed looking over these pictures! 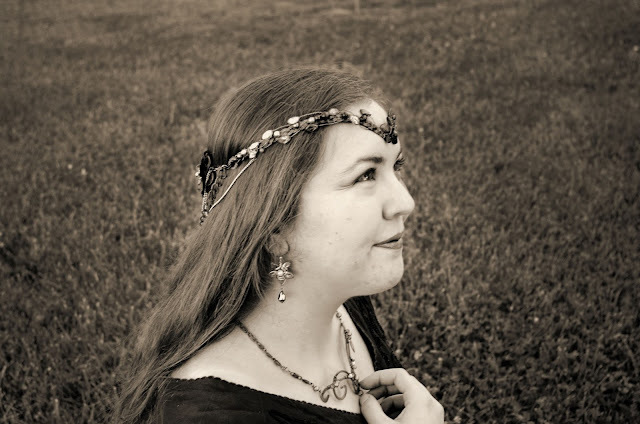 I certainly enjoyed making this circlet. It's the wrong season, but once the pinecones are again littering the ground, I will make a tutorial on these pinecone flowers! 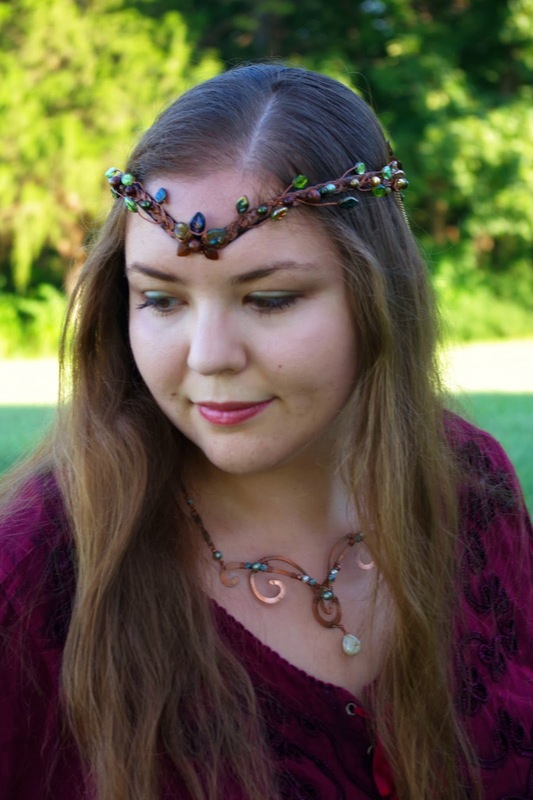 UPDATE: This circlet has sold! I hope that the new Entess loves it! If anyone is interesting in commissioning one just email me at shealynnsfaerieshoppe@gmail.com. (Above is the Entwife circlet I made for the wedding; below is the very first Entwife piece I made). I had so much fun creating the red and silver masquerade mask a few months ago. The piece was a hit at the dance, and there is nothing quite like the joy of designing really unique pieces. 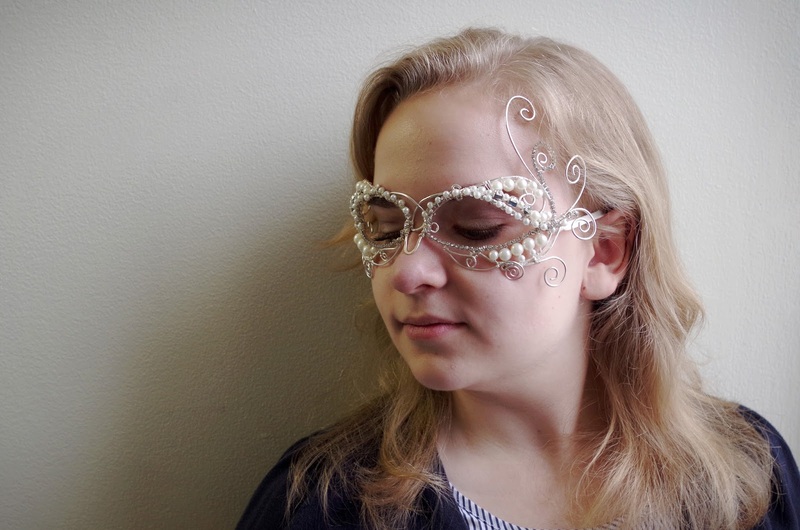 Masquerade masks are fun and beautiful and all, but once you add some wire and swirls and beads and rhinestone, it doesn't seem to get much better! When I received an email asking me to create custom wirewrapped masks for a wedding, it made my day! At the time, though, I didn't realize how much work it would be! That first mask was an experiment in a true sense; although very nice, it wasn't as stable and elegant as it could have been. The first mask was the women's rhinestone and cream pearl. The bride wanted a fuller and more solid design than the first red mask, and she sent me inspiration photos for an extravaganza of swirls to go up one side of the mask. (It's great to work with people who have an eye for design and knows what they want, but are still happy to let me do my thing). The base was made from 12 gauge sterling silver plated wire. The skeleton of the mask is by far the most difficult, as it is entirely freeform. Imagine taking 12 inches of stiff wire, pliers, a hammer, and an avil and trying to make a sturdy mask with symmetrical sides that will form to anyone's face, sit comfortably on the nose, and will not fall apart. (It's a wee bit difficult and took me several tries). Adding the swirls was next, and while this intricate hammered wirewrapping is very similar to the techniques I use regularly, forming everything to fit a face added a third dimension-- literally-- to the techniques. 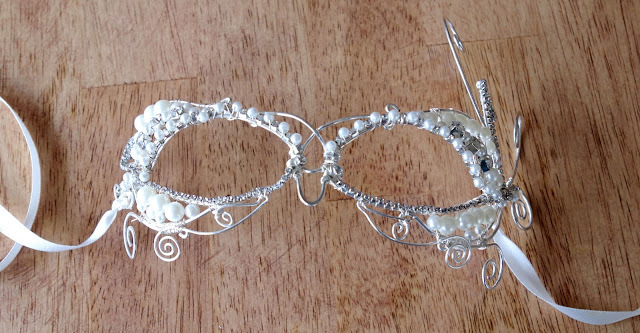 All of the pearls and rhinestones were lashed to the mask using thin sterling plated wire. I was surprised by how much stability the beadwork added to the piece! Unfortunately, thanks to crazy college classes, I just barely made the deadlines I set. I didn't have a chance to take many photographs of the white mask, but these here modeled by my lovely friend do a great job of showing how the mask wears on a real person! Now, for my pride and joy. Don't get me wrong; I love the white mask and am in love with all of the design elements that my customer requested. But this black mask is a step up in craftsmanship and technique for me. A leap, really. Crafting this was one of those magical times when every almost-mistake turned out to be exactly what I needed, and my fingers and eyes seemed to work of their own accord. So many technical "aha!" insights fired in my brain while problem-solving this design. My fingers now know their way around wirewrapping like they didn't before. It's a strange thing to explain, and another use of flowery, cliched language, but something "clicked." I was asked to create this piece after the white mask was delivered, and from the start we needed it to be structurally a different kind of piece. The white mask has large eye-holes to showcase nice bold eye makeup, but unless the groom wanted to sport eyeshadow and guyliner, this mask needed significantly smaller eye holes. The problem is that everyone's eyes are really unique, and I needed to find a sweet spot where this mask could fit anyone's face without covering the eyes. The general shape of the mask, too, needed to be different. I filled an entire sketchbook page with shape ideas. 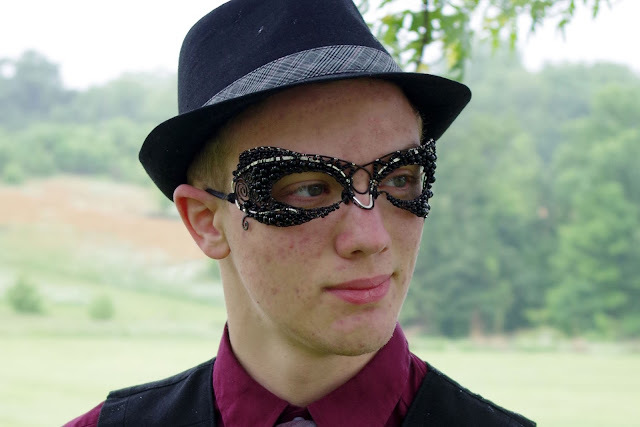 How should I make a pearl-studded wirewrapped swirly mask look more masculine? The design that I finally decided on was much more solid and filled-out than any mask I've made before. The swirls are contained inside the mask, on the sides, rather than spiraling around the outside of the mask. I attached dozens and dozens of tiny beads using tiny wire wrapped in very specific ways so that the entire skeleton of the mask was solidly filled with black pearls. The beaded zig-zags above the nose was another design input from the bride; I had been struggling with how to fill in that space without overwhelming it. Her idea worked really well! 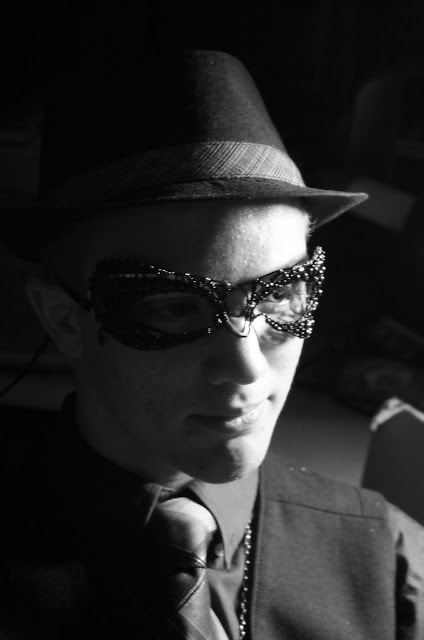 My brother asked to model it, and, in typical drama-kid style, jazzed up his look with some "dashing accessories." I am so honored to make custom jewelry like this, and am especially grateful to be making pieces that will be a part of this couple's marriage beginnings! Theirs sounds like a very unique wedding and I wish them all the joy. When my Typography instructor told us that we were going to make our own books-- by hand-- the entire class started freaking out. There were two assignment options: create a handmade book celebrating typefaces, or create a book of The Waste Land by T.S. Eliot. Some of my friends created awesome design books about typefaces, but since my emphasis is in illustration in addition to design, I chose The Waste Land. Some of my classmates looking through sample books from previous students. That day was OVERWHELMING. Doing Eliot's book would give me an opportunity to create drawn illustrations. After a solid year of only design classes and no "artsy-art" classes, I relished the chance to sit down with a sketchbook, guilt-free, and have some fun. Plus, I studied The Waste Land in high school as part of my classical curriculum. I love returning to old high school assignments, as I inevitably get more out of my second read. The Waste Land is a long, modernist poem that I think was purposefully made to have the most obscure and scattered references ever. Gah. Quite the challenge to illustrate. 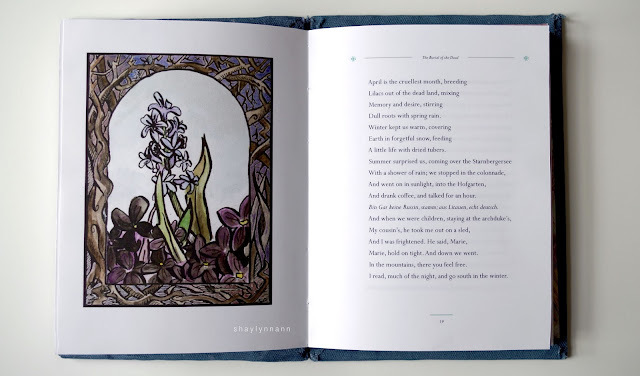 To begin, we proofread the poem, set up a template in InDesign, and formatted the text. The first step was actually the longest for me, although it's the hardest to make others appreciate. (My family, for instance, was easily impressed by the physical book looked at me in astonishment when I tried to explain that the digital part was hardest). Fix the bad kerning before the "W"
What the heck is a colophon? Write one. Edit the tracking so that the extra-long lines don't run into the margin!!! FIX THE TABBED QUOTES AND REPLACE WITH EM-SPACES BECAUSE DESIGN! 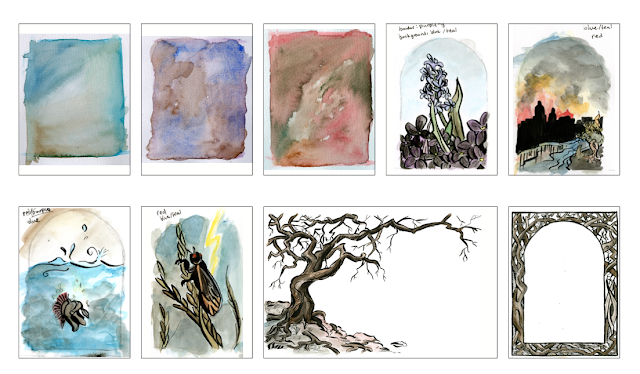 I developed the imagery and symbolism for the illustrations by reading through the full poem, reading through Kolbe Academy's analysis notes, and doing lots of doodles. Eventually I sketched everything on Bristol board, then drew it with a dip pen and india ink. (Sidenote: I love my dip pen. I'm just getting started with actual calligraphy, but it's also great for drawing. The pressure changes makes the ink flow with such energy, and it does help to make quick illustrations much more lively). 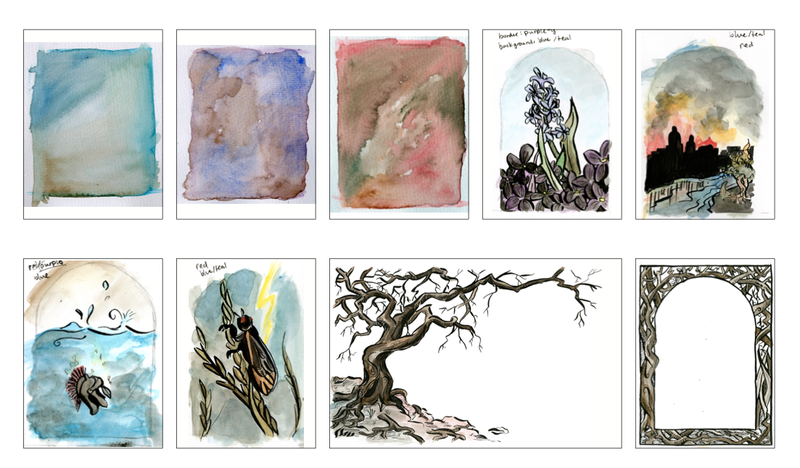 I then watercolored the illustrations and scanned them in on high resolution. The rest was removing backgrounds in Photoshop, tweaking colors and spacing, and just fixing all those little technical details. The Waste Land is really depressing, so I had a bit of a time trying to tone down my normally happy art style to use darker, creepier colors. Oh! While I was working on this, something cool happened! The girls who run Humans of Springfield, a photojournalism facebook page, ran into me while I was working outside and interviewed me! They were super sweet and it definitely made my day, as I was super stressed earlier that day. You should check out their page and browse through their growing photo/interview collection. In addition to these chapter illustrations and the tree frontispiece, I went into overkill-overachiever mode and calligraphied every title and header for the entire book. Looking back at it now, a mere month later, I'm really not happy with the lettering. I've spent a couple of days practicing good pointed pen script, and I see a few problems here, but it was a learning experience and still looks cool! After everything was laid out digitally, I took my book to the printer. I had previously spoken to a local printer, who had the specialty paper my instructor had approved. But in the end, they messed up the print about three times and all of the colors were deadened. I couldn't get a refund, either! Getting my two copies of the book printed was, overall, a three-day ordeal in the middle of studying for all of my other finals. In the end, I got a copy printed at the cheap on-campus print shop that all of the professors say not to use because they screw up your prints. But they actually printed it really well, on regular thick stock, and for half the price! Sewing the book. 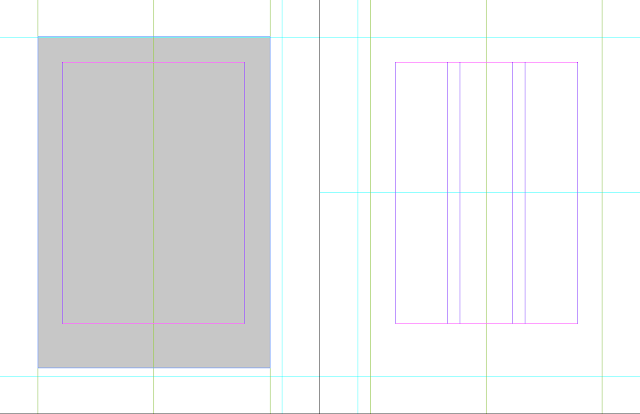 My practice signature is visible on the right, and the half-finished covers are at the top of the image. Next was the bookbinding, which I had expected to be ridiculously difficult, and which turned out to be very enjoyable. 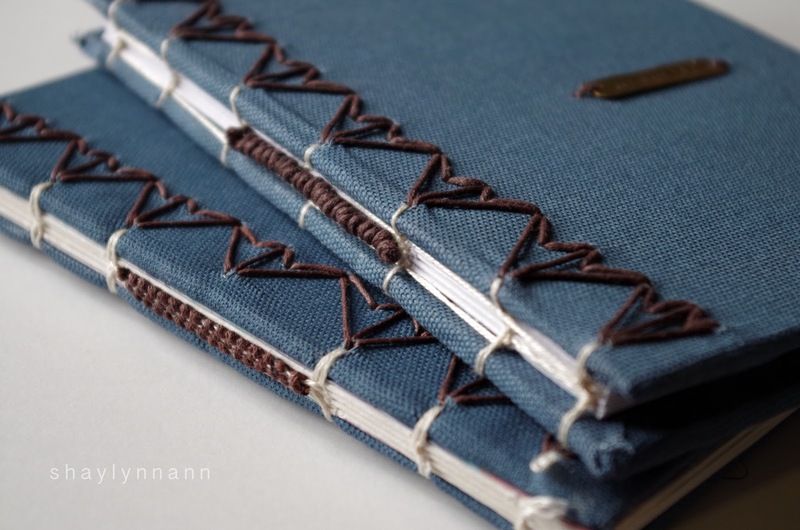 I used a mix of Coptic stitch and Japanese stab binding to sew the book together. The book used 8-page signatures, which means that I take four sheets of paper, fold it in half, punch in the holes, and then use cotton cord threaded onto a rounded needle to attach the signatures to one another. Once the text was bound, I cut the book with a utility knife and prepared to attach it to the covers with a Japanese style stitch. The cover itself is made from two layers of matboard glued together with a sturdy blue linen stretched across. The title is a piece of stamped brass. 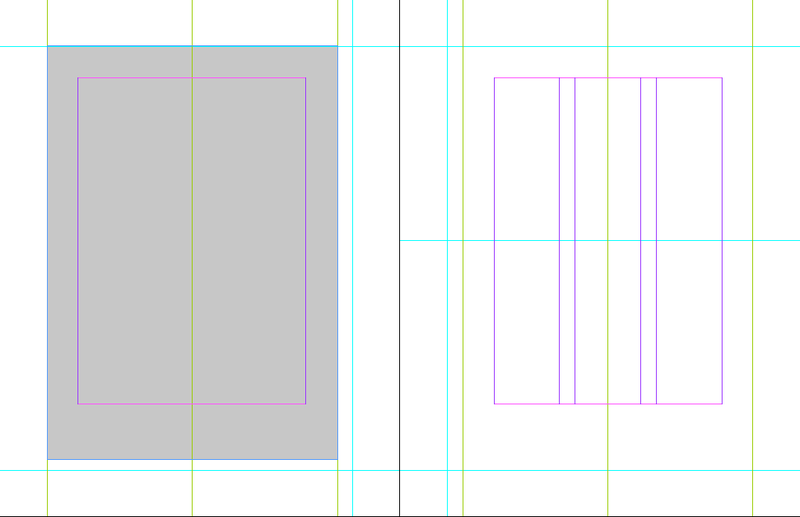 As part of this project, we had to develop endpapers for the book. Endpapers are used to help the cover and the paper stick to one another, and they also really help to set the visual tone of the book. I wanted to try paper marbling (I'd given it some attempts two or three years ago) and my first attempt, done at school during a spare half hour, really didn't work. And I think the endpapers turned out really well! I did produce two books for this project. One was with the first, bad print (it is really expensive to print in color, and they didn't refund the bad print, so that and a couple other long stories all considered, I went ahead and kept the bad print for one copy). The differences, to say the least, are drastic. That dull, weird yellow page just doesn't cut it. The one thing that I was really upset about with this project is that the school keeps the good copy. I understood why we made two copies-- it is a huge learning curve-- and I like that she graded the good copy. But now my book is going to go in a summer exhibit in the school library (I think it's there!) and then it will get stored in a box in a back room, to be pulled out once every year for new students to look at. I spent so much time and money on this book, and now I've only got the second-best copy for my portfolio! My classmates also made some beautiful pieces-- I wish I could share them with you! By the time finals came around (both this book and several PDF portfolios were due the day we took our exam) we were all dead with homework exhaustion! But despite the overwhelming workload, this book is tied for the best project of my entire sophomore year. :) Projects are always the best when they are over and your hard work has paid off!